ARUN Jaitley, named Senapati of the BJP’s akshauhinis, has visited his troops. S M Krishna, appointed charioteer of the Congress armies, has inspected his field formations. The conches have finally sounded announcing the order of battle. Kurukshetra is all set. So who is planning what chakravyuhas? We can safely leave the Congress and JDS alone for the moment. They plan nothing new. One will be busy with self-destructive faction fights, the other with the nano technology of separating sub-castes from sub-sub-castes. It’s the BJP’s approach that bears implications for the future, because it has declared that it wants to repeat Gujarat in other states. Can it? Of the three basic factors that made Narendra Modi what he is in Gujarat, only the first applies to Karnataka - Congress factionalism. The second factor, not replicable elsewhere, is that it was Modi’s victory rather than the BJP’s. 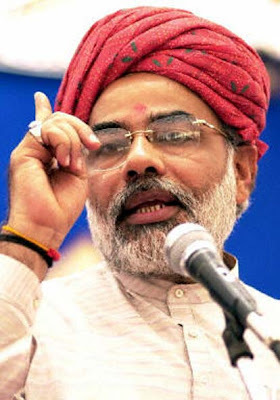 He actually kept the BJP and the RSS at bay by the strength of his personality, his ability to sway audiences and, importantly, the perception he has created that he is personally above corruption. In Karnataka there are BJP leaders who can match Modi’s arrogance, but not his oratory, and certainly not his image of corruptionlessness. Many of the BJP leaders who tasted power in Delhi and later in Karnataka proved to be not second to Congressmen in corruption. In effect, then, the BJP’s chief option in Karnataka is to try out the third and most important factor behind the Gujarat phenomenon, Hindutva extremism. This went so deep into people’s psyche in Gujarat that today communalism is no longer a discussed issue there. There’s nothing to discuss; it’s there, entrenched, embedded in the mind, solidified. A former IIM-Ahmedabad Professor, Shreekant Samprani, said blandly that “an overwhelming majority in Gujarat is unrepentant about 2002... are not even sorry for (the riot victims)”. Modi’s ultimate triumph is that he has succeeded in changing the thinking of the “overwhelming majority” of Gujarati voters. Profound as this change is, it won’t be easy to bring it about in other states. Firstly, the polarisation will have to be contrived over a fairly long period and violently when necessary. Secondly, the majority will have to be of a kind that will be unrepentant about violence while the minority should be willing to be ghettoised silently. Both these are virtually unthinkable in Karnataka, Andhra, Tamil Nadu, Kerala, even Orissa. Their cultural histories and literary heritage do not tend to facilitate majority rigidification of the Gujarat kind. As for the minorities, there may be soft targets that can be easily hit for point-scoring. But the real targets, of the kind that Modi has marginalised in Gujarat, are too many, too assertive, and too organised to be simply beaten down. So when the BJP talks about repeating the Gujarat formula in other states, more is involved than winning or losing an election. We are talking about changing people and their minds, about changing the history and culture of India, about changing the meaning of India. We are talking about moving away from what has made us what we are - Sanatana Dharma. Which means: If Modiism wins, Bharatiyata loses.